SUNNYVALE, Calif., April 28, 2015—Trimble announced today that it is supporting new construction modeling workflows with enhanced integration between Bentley Systems’ AECOsim Building Designer software and Trimble’s Vulcan sheet metal cutting software for the HVAC (heating, ventilation and air conditioning) market. The new workflow integration enables design models to be shared easily, securely and accurately. The move expands the companies’ ongoing collaboration around “Construction Modeling” and enhanced information mobility—which includes a goal to leverage Bentley i-models when Trimble and Bentley solutions are used together in project delivery. Vulcan is a sheet metal cutting software solution for HVAC contractors, design/build firms and duct manufacturers, who rely on the software to increase shop productivity, reduce waste and improve their bottom lines. AECOsim Building Designer is Bentley’s software for teams involved in the design, analysis, contracting, documentation and visualization of buildings. The platform leverages i-models for the open exchange of project information so that team members may share and interact with complex project data and across product lines and technology platforms. 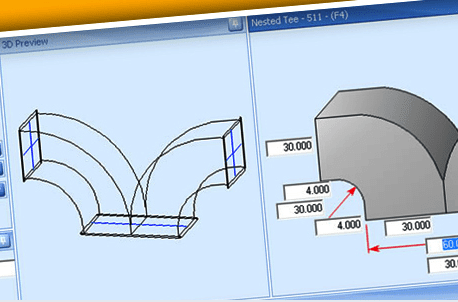 By extending Trimble and Bentley’s existing i-model integrations to Vulcan, users can directly transmit design drawings to sheet metal fabrication, which can reduce errors and rework, and ultimately save time and costs. The new capabilities will be incorporated into Vulcan 2015 version 2, which is expected to be available in the second quarter of 2015 through Trimble Buildings’ MEP Division. More information is available at: http://mep.trimble.com/products/fabrication/vulcan. For additional information about Bentley Systems and its comprehensive software solutions for advancing the design, construction and operations of infrastructure, visit: www.bentley.com. Trimble Buildings, a part of Trimble’s Engineering and Construction segment, is a world leader in solutions that optimize the complete Design-Build-Operate (DBO) lifecycle of buildings. Incorporating the Trimble Connect collaboration platform and spanning top brands such as SketchUp, Tekla, Gehry Technologies, Proliance, Vico Office, WinEst, Accubid, Manhattan Software, and more. Trimble’s product and professional service offerings improve productivity, visibility and data interoperability, from simulation to renovation. Used in over 150 countries around the world and supported by a global dealer and distribution partner network, Trimble technology is a mainstay of the building industry. Information on Trimble Buildings’ DBO portfolio is available at: http://buildings.trimble.com.